On a chilly gray Wednesday in late September, there’s a special buzz on campus. 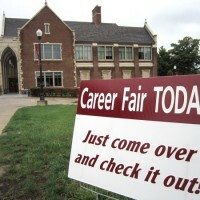 The time has come for the annual Career Fair—and for students to begin knocking on some doors. Recruiters from across the country fill the Intramural Room with high hopes of finding their ideal candidates, and students clad in suits and heels make their entrance with resumes in hand, ready or not to connect with their futures. For collegians caught up in the craziness of this thrilling yet uncertain stage of life, preparing for what’s next is undoubtedly daunting, as recent graduate Emily Fritz can attest. “Bridging the mental gap between academia and real-world experience is actually kind of difficult,” admits the 2015 Accounting & Finance alumna, but she found that starting early in the process helped to ease the transition. Taking advantage of the opportunity to sharpen her professional communication skills at the Career Fair her sophomore year, Fritz introduced herself to Grossman Yanak & Ford, a regional certified public accounting and consulting firm headquartered in Pittsburgh. Making this first connection built the foundation for an ongoing relationship which led to a summer internship and eventually the full-time audit associate position Fritz holds today. 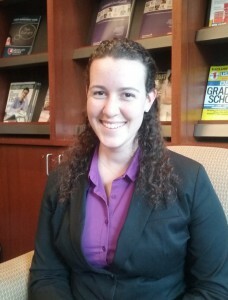 Although her strong work ethic as a student and aptitude in the classroom undoubtedly set her up for success, Fritz doesn’t underestimate the importance of the Career Fair in preparing her for post-college professional life. 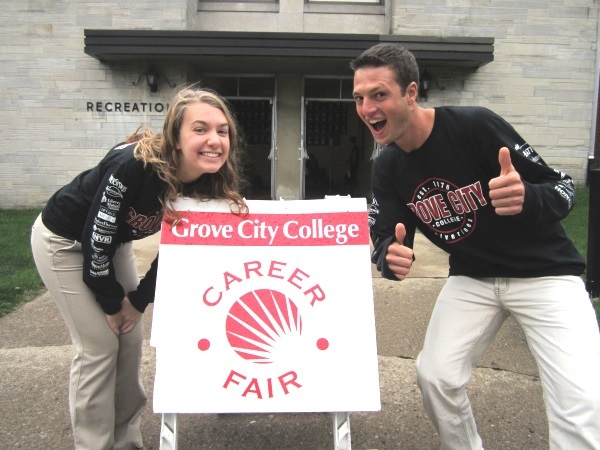 “Grove City has one of the largest career fairs I’ve ever seen and offers as many opportunities to make professional connections as you can possibly get,” affirms Fritz, who is just one shining example of the many success stories that unfold every year. With over 160 employers and graduate schools in attendance this year, it’s no wonder that students are raving. 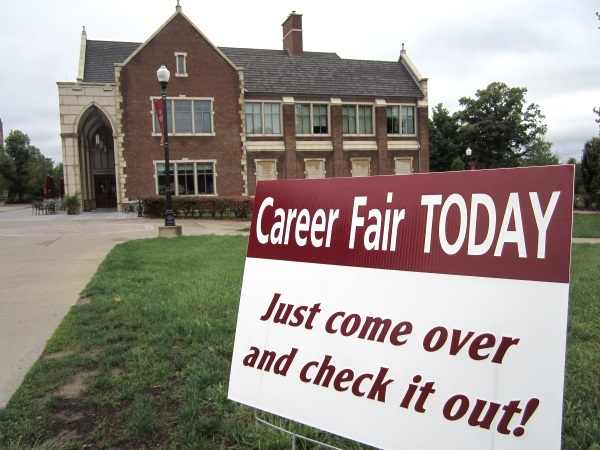 Since launching its first Career Fair back in 1999, Career Services has faithfully invested in the development of this annual event which has grown significantly over the past two decades. This year the Intramural Room was packed with booths boasting numerous full-time, internship, co-op, and summer positions for every major in various locations ranging across 23 states. A significant number of alumni recruiters attended the fair, offering fellow Grovers helpful insight from the other side of the commencement-day stage. The fair’s sheer magnitude for a school of Grove City’s size is certainly unique, but perhaps even more impressive is the breadth of fields represented. From big name organizations that have attended over the years like Ernst & Young, Peace Corps, Teach For America, General Electric, Mylan, Honda R&D, PNC, HP, and Chick-fil-A to government agencies including the Department of Justice, ministries such as Fellowship of Christian Athletes, seminaries like Westminster Theological, and graduate schools including Penn State and Carnegie Mellon Universities, the Career Fair yields a full harvest of positions ripe for the applying. No matter where your passions lie nor how well defined they may be, there’s no better way to move forward than checking out the Career Fair. For upperclassmen on the job hunt, opportunities to connect abound. For underclassmen, the fair presents an incredible opportunity to explore internships and summer jobs and develop professional networking skills that can be of great value before diving into the formal job search down the road. As the festive winter season approaches, only time will tell what stories unfold from Career Fair 2015.